With mile upon mile of picture-perfect coastline, delicious seafood cuisine, warm balmy weather and an unusual range of fragrant flora, a walking holiday in Portugal is a real treat for the senses. 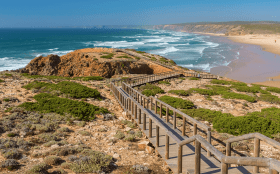 Yet, despite all that it has to offer holidaymakers, Portugal remains traditional and gloriously undeveloped, making it a wonderful location for a self-guided walking holiday. 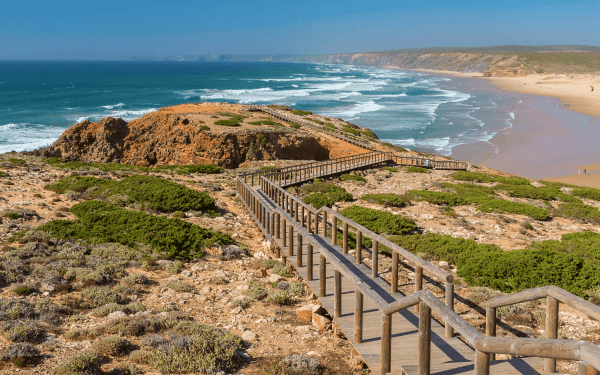 Walkers visiting Portugal can expect to spend their days discovering some of the most beautiful and secluded coastal walking in Europe, set among charming historic towns influenced by Moorish architecture and finished off with delicious local food and wine. Add to this the fact that Portugal enjoys more than 3,000 hours of sunshine per year and you have the perfect warm-weather getaway. Embark on a Portugal walking holiday with Celtic Trails and benefit from quality, hand-picked accommodation, bespoke route notes and luggage transfers all included. Pristine beaches, medieval castles, quaint fishing villages and the coursing Atlantic that rushes to shore all contribute to one of the most idyllic stretches of scenery for walking in Europe. Each day walking through the Portuguese countryside seems to peel back new qualities in scenery, whether it’s the verdant forest tracks of the country or the unforgettable experience of watching the sun set over the Cabo St Vincent - the most south-westerly edge of the European mainland. Some of Portugal's top hiking trails operate as a means of way of bringing visitors to the beautiful rustic areas of Portugal that have yet to receive the tourist numbers of the Algarve, nor have the extensive resources to cater for the package holiday crowd; here you’ll find life conducted at a much slower, relaxed pace here on the lesser-known side of Portugal’s countryside. Located at the south-western tip of mainland Europe, Portugal enjoys some of the exuberant of the fair-weather hitting the Mediterranean. As such, walkers may want to consider visiting in spring or autumn, where nature and flora is at its fullest, and the effects of the weather are perceptively gentler - making progress along the path noticeably easier. You’ll find that by taking what is typically referred to as the ‘shoulder season’, you’ll not be confronted with any signs of the crowds who flock to the Algarve over summer, and if you’re planning an extension to your trip by visiting somewhere like Lisbon, you’ll find moving around the metropolitan area more carefree outside of high summer. By Plane – Lisbon, the capital, handles the grand majority of Portugal’s arrivals by air, and there are ample ways of getting to the start of your walk, either by train, shuttle bus or taxi (or a combination of all three) from the airport. By Train – it is possible to arrive in Lisbon via the Eurostar train services departin from major cities across the European mainland. If you’re travelling from London St Pancras, you’ll need to change trains at the Spanish Border. All your luggage is transferred between each accommodation we book for you (selected on first-hand experience and the strength of feedback given by our walkers), as well as taxi transfers to and from the path (where necessary). Getting to the start and leaving the end point of your walk is not included, but we are more than happy to advise on the best ways to travel. As with all travel elements of your trip, we will advise and provide the information you need on how to get to the start of your walk, as well as how to get back home again following the route’s completion. By Train – The Portuguese train service is fairly uniform, except at the distinction between long-distance and urbano services, the latter being cheaper and more frequent, although the former are generally more comfortable (often arriving equipped with restaurant carts). 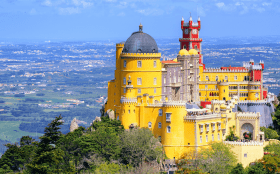 Unless you’re making more than a few journeys in Portugal by train, acquiring a rail pass is not necessary, although you may want to consider it, the details of which can be found here. 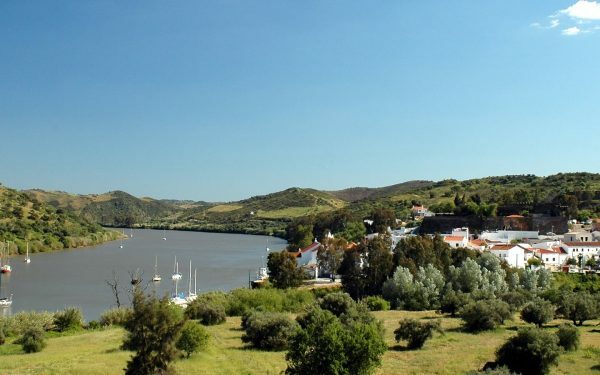 By Bus – Like most European countries, Portugal has a steadfast chain of bus services, serving the same routes as trains (at a fraction of the price) as well as smaller villages and rural areas. Tickets are bought at the terminals machines or booths, although if you can’t find any in the vicinity, it’s worth checking the local cafés, who are generally known to double-up as bus ticket vendors. Taxi – Services are generally reliable, at a reasonable rate. If you’re arriving in Lisbon airport, we advise travelling from the terminals by shuttle, rather than by private taxi, which will often be the more economical option. For continually updated information on taxis in Portugal, Centraldetaxis.pt is a great place to start. You can compare taxi fares using this taxi fare calculator to get an idea of hotel/airport transfers or any extra journeys you may be looking to make outside of your route. There's also an app for Android phone for booking taxis on the Central de Taxis website. National/International customer support phone numbers are also available on the website. Portugal’s official language is Portuguese. It’s a romance language, with slight similarities to other languages of the Mediterranean (Italian, Spanish etc), but you won’t certainly won’t earn any favours by attempting to communicate with the locals in Spanish. Generally speaking, it’s well worth putting in the extra time to learn some of the phrases, and you'll receive a warmer reception by the Portuguese people you meet for making the effort. English speakers are far fewer in number than other western European countries, especially in the more rural areas of the country. As is so often the case, you will find that most professionals working in the tourism and hospitality sector will have a fairly good grasp of communicating in English. Portugal uses the Euro, with £1 (GBP) being worth about 1.14€, and $1 (USD) trading at 0.86€. ATMs are frequent in towns, cities and villages although there are some exceptions, such as Vale Seco, Arrifana and Cape St. Vincent on the Rota Vicentina. Banks are generally the best place to exchange foreign currency while out on the path, currency exchange booths tend to crop up near tourist attractions and don’t always offer the most competitive rates. Portugal, and mainland Europe in general, are not known for a tipping culture. However, tips are appreciated and certainly not unheard of. Anything between 5% and 15%, depending on the quality of service is acceptable. It is not necessary to tip bar staff as you will usually order and collect your drinks at the bar. Portugal’s proximity to the coast has a significant influence on the type of food available, with many traditional dishes incorporating seafood. Portugal is also famous for its chouriço (a spicy sausage, similar to chorizo) as well as being the originator of tempura batter. In this day and age, you’ll almost always have a vegetarian option in bars and restaurants, with gluten and dairy free options not uncommon in accommodations either. You may find that Portuguese cuisine incorporates flavours that are typically associated with a Mediterranean style of cooking. Cakes and patisseries are also very popular in Portugal, with the custard tart being one of its most famous cultural exports. Recent EU legislation have eliminated roaming charges within the EU, although there are some exceptions to the rule that can catch you out if you’re unaware. For example, if you’re using data you will be charged out of your data allowance, and the same goes for accessing your voicemail. The rules change between providers, your best policy is always to check your phone contract/plan first. One possible option would be get an Portugeuse SIM card, where you’ll be charged domestic rates. This can be quite handy for finding museum hours, booking tables and calling taxis, without incurring the aforementioned data access charges. 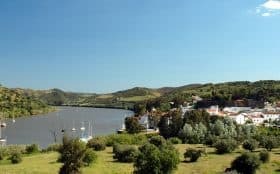 Whilst phone and internet coverage across Portugal’s cities is generally good, with 4G rolled out successfully in recent years, be aware that rural areas may have limited coverage. For this reason it is best to plan ahead and not rely on them when you are out and about. In towns and villages there will generally be phone reception but not always mobile internet. It is increasingly common to have free wi-fi in cafes, hotels and B&Bs, but not guaranteed. Healthcare systems vary from one country to the next and may not include everything you expect to be free of charge where you come from. EU nationals can use their European Health Insurance Card (EHIC) to access the necessary state-provided healthcare in Portugal at a reduced cost, or even for free, though the Portuguese authorities will determine whether the treatment can wait until the return home. The EHIC card also covers pre-existing medical conditions, though not for anyone travelling with the express purpose of seeking medical treatment. Emergency numbers and contacts are included as part of your walk pack.